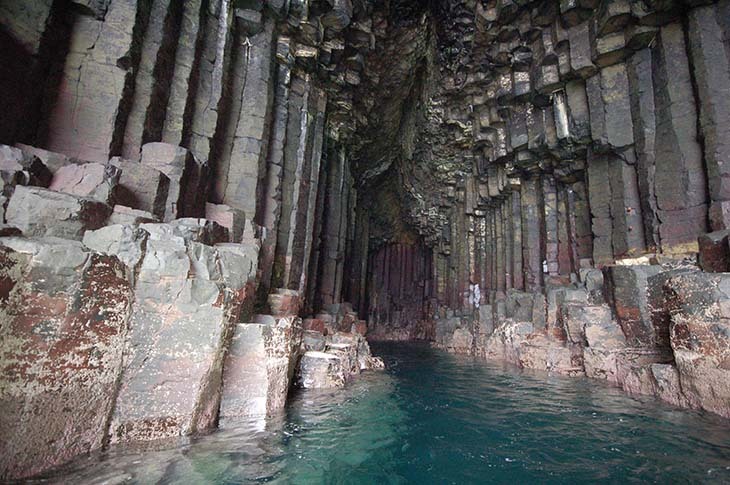 Discovering Fingal’s Cave in Scotland, an ominous sea cave on the uninhabited island of Staffa in Scotland formed entirely from basalt and lava. The cave is seventy two feet tall and two-hundred-seven feet deep. 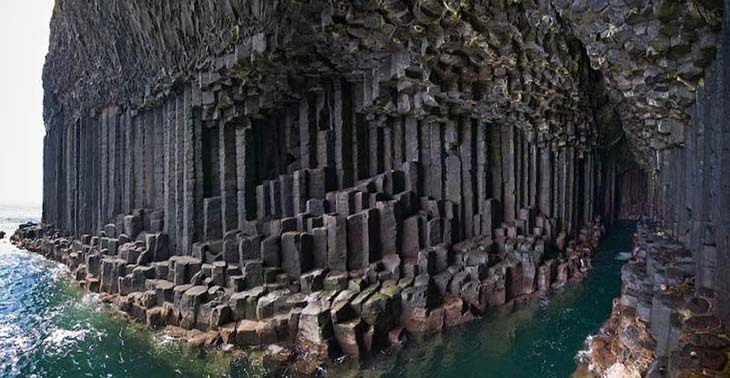 The hexagonal columns of basalt that make up the interior walls are visually astounding. The natural cathedral-like cave is a must-see while exploring Scotland. The cave was formed by the flow of lava upon basalt. As the lava cooled it resulted in a blocky tetragonal pattern forming the long hexagonal columns that make up the cave. The size of the cave and its naturally arched roof give it the atmosphere of a natural cathedral, and the echoes of the waves throughout the cave create eerie sounds. The cave’s Gaelic name, An Uaimh Bhinn, means “the melodious cave.” It became known as Fingal’s Cave after the hero of an epic poem, by 18th-century Scots poet-historian James Macpherson. In Irish mythology, the hero Fingal is known as Fionn mac Cumhaill, and it is suggested that Macpherson rendered the name as Fingal, meaning “white stranger”. Staffa is a small uninhabited island on the West Coast of Scotland, near Mull and Iona. The island is famous for its natural beauty, especially Fingal’s Cave. This spectacular cave has inspired many famous visitors throughout the centuries including the composer Felix Mendelssohn, the author Walter Scott, and the poet William Wordsworth. Today it is a popular visitor attraction, and an excellent place to visit for wildlife lovers. The island is home to puffins, and lucky tourists could spot seals, dolphins, basking sharks, or whales in the surrounding sea. One can visit the cave through boarding one of the many cruises which tour the island, or travel to the small island of Staffa and hike into the cave by stepping from column to column. Many tours to the Isle of Staffa are combined with visits to the Isle of Iona, and to the Treshnish Isles, which is a group of seven small uninhabited islands. There are a number of companies who run organised tours to Staffa. Tours operate from Oban, Fionnphort on Mull, the Isle of Iona, and Tobermory on Mull. Prices start from $45 USD for an adult. Unfortunately unless you have your own boat, there isn’t another way to visit Staffa, so be sure to include tour charges in your travel budget. 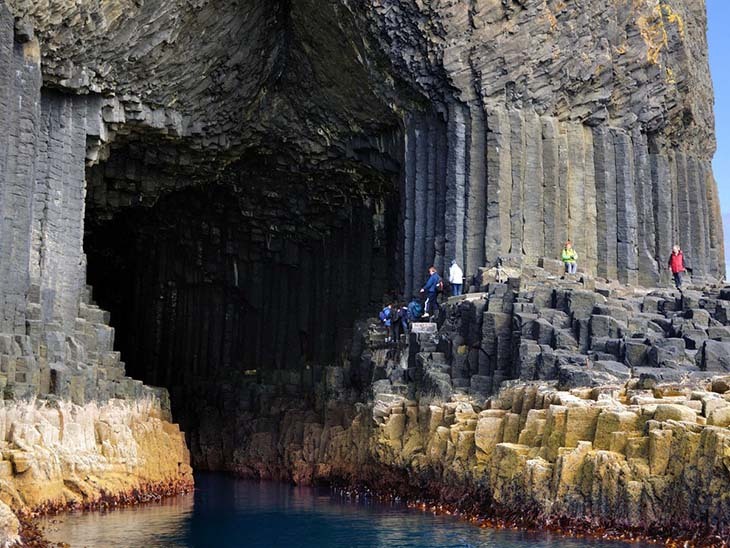 Visit Staffa, Fingal’s Cave and Iona on a one day tour through Staffa Trips, which start from $45 USD per person. Take a 45 minute sea journey to Staffa and Fingal’s Cave, where puffins can be seen ashore in season and often guillemots, fulmars, great skuas, eider ducks, gannets, kittewakes, black-backed gulls, great northern divers and razorbills on the water. The trip lasts three hours and disembarks at Fionnphort or Iona. Visit www.staffatrips.co.uk for more information.